India is endowed with a rich variety of mineral resources due to its varied geological structure. Bulk of the valuable minerals are products of pre-palaezoic age and are mainly associated with metamorphic and igneous rocks of the peninsular India. The vast alluvial plain tract of north India is devoid of minerals of economic use. The mineral resources provide the country with the necessary base for industrial development. A mineral is a natural substance of organic or inorganic origin with definite chemical and physical properties. Minerals may be grouped under two main categories of metallics and non-metallics. Metallic minerals are the sources of metals. Iron ore, copper, gold produce metal and are included in this category. Metallic minerals are further divided into ferrous and non-ferrous metallic minerals. All those minerals which have iron content are ferrous such as iron ore itself and those which do not have iron content are non-ferrous such as copper, bauxite, etc. Non-metallic minerals are either organic in origin such as fossil fuels also known as mineral fuels which are derived from the buried animal and plant life such as coal and petroleum. Other type of non-metallic minerals are inorganic in origin such as mica, limestone and graphite, etc. The North-Eastern Plateau Region : This belt covers Chotanagpur (Jharkhand), Orissa Plateau, West Bengal and parts of Chhattisgarh. The South-Western Plateau Region : This belt extends over Karnataka, Goa and contiguous Tamil Nadu uplands and Kerala. This belt is rich in ferrous metals and bauxite. It also contains high grade iron ore, manganese and limestone. This belt packs in coal deposits except Neyveli, which has lignite. This belt does not have as diversified mineral deposits as the north-eastern belt. Kerala has deposits of monazite and thorium, bauxite clay. Goa has iron ore deposits. The North-Western Region : This belt extends along Aravali in Rajasthan and part of Gujarat and minerals are associated with Dharwar system of rocks. Copper, zinc have been major minerals. Rajasthan is rich in building stones i.e. sandstone, granite, marble. Gypsum and Fuller’s earth deposits are also extensive. Dolomite and limestone provide raw materials for cement industry. Gujarat is known for its petroleum deposits. The Himalayan belt : The Himalayan belt is another mineral belt where copper, lead, zinc, cobalt and tungsten are known to occur. They occur on both the eastern and western parts. Assam valley has mineral oil deposits. Besides oil resources are also found in off-shore-areas near Mumbai Coast (Mumbai High). Ferrous Mineral : Ferrous minerals such as iron ore, manganese, chromite, etc., provide a strong base for the development of metallurgical industries. Our country is well-placed in respect of ferrous minerals both in reserves and production. Iron Ore : India is endowed with fairly abundant resources of iron ore. It has the largest reserve of iron ore in Asia. The two main types of ore found in our country are haematite and magnetite. It has great demand in international market due to its superior quality. The iron ore mines occur in close proximity to the coal fields in the north-eastern plateau region of the country which adds to their advantage. The total reserves of iron ore in the country were about 20 billion tonnes in the year 2004- 05. About 95 per cent of total reserves of iron ore is located in the States of Orissa, Jharkhand, Chhattisgarh, Karnataka, Goa, Andhra Pradesh and Tamil Nadu. Manganese : Manganese is an important raw material for smelting of iron ore and also used for manufacturing ferro alloys. Manganese deposits are found in almost all geological formations, however, it is mainly associated with Dharwar system. Orissa is the leading producer of Manganese. Maharashtra is also an important producer of manganese. The manganese belt of Madhya Pradesh extends in a belt in Balaghat-Chhindwara-Nimar-Mandla and Jha ua districts. Andhra Pradesh, Goa, and Jharkhand are other minor producers of manganese. Non-Ferrous Minerals : India is poorly endowed with non-ferrous metallic minerals except bauxite. Bauxite : Bauxite is the ore which is used in manufacturing of aluminium. Bauxite is found mainly in tertiary deposits and is associated with laterite rocks occurring extensively either on the plateau or hill ranges of peninsular India and also in the coastal tracts of the country. Orissa happens to be the largest producer of Bauxite. The patlands of Jharkhand in Lohardaga have rich deposits. Gujarat, Chhattisgarh, Madhya Pradesh and Maharashtra are other major producers. Copper : Copper is an indispensable metal in the electrical industry for making wires, electric motors, transformers and generators. It is alloyable, malleable and ductile. It is also mixed with gold to provide strength to jewellery. The Copper deposits mainly occur in Singhbhum district in Jharkhand, Balaghat district in Madhya Pradesh and Jhunjhunu and Alwar districts in Rajasthan. Among the non-metallic minerals produced in India, mica is the important one. The other minerals extracted for local consumption are limestone, dolomite and phosphate. Mica : Mica is mainly used in the electrical and electronic industries. It can be split into very thin sheets which are tough and flexible. Mica in India is produced in Jharkhand, Andhra Pradesh and Rajasthan followed by Tamil Nadu, West Bengal and Madhya Pradesh. In Jharkhand high quality mica is obtained in a belt extending over a distance of about 150 km, in length and about 22 km, in width in lower Hazaribagh plateau. In Andhra Pradesh. Nellore district produces the best quality mica. In Rajasthan mica belt extends for about 320 kms from Jaipur to Bhilwara and around Udaipur. Mineral fuels are essential for generation of power, required by agriculture, industry, transport and other sectors of the economy. They lie in Jharkhand-Bengal coal belt. Coal : Coal is a one of the important minerals which is mainly used in the generation of thermal power and smelting of iron ore. Coal occurs in rock sequences mainly of two geological ages, namely Gondwana and tertiary deposits. About 80 per cent of the coal deposits in India is of bituminous type and is of non-coking grade. The most important Gondwana coal fields of India are located in Damodar Valley. Tertiary coals occur in Assam, Arunachal Pradesh, Meghalaya and Nagaland. Besides, the brown coal or lignite occur in the coastal areas of Tamil Nadu, Pondicherry, Gujarat and Jammu and Kashmir. Natural Gas : The Gas Authority of India Limited was set up in 1984 as a public sector undertaking to transport and market natural gas. It is obtained alongwith oil in all the oil fields but exclusive reserves have been located along the eastern coast as well as (Tamil Nadu, Orissa and Andhra Pradesh), Tripura, Rajasthan and off-shore wells in Gujarat and Maharashtra. Crude petroleum occurs in sedimentary rocks of the tertiary period. Oil exploration and production was systematically taken up after the Oil and Natural Gas Commission was set up in 1956. Till then, the Digboi in Assam was the only oil producing region but the scenario has changed after 1956. In recent years, new oil deposits have been found at the extreme western and eastern parts of the country. Non-Conventional Energy Sources Fossil fuel sources, such as coal, petroleum, natural gas and nuclear energy use exhaustible raw materials. Sustainable energy resources are only the renewable energy sources like solar, wind, hydrogeothermal and biomass. These energy sources are more equitably distributed and environmental friendly. The non-conventional energy sources will provide more sustained, eco-friendly cheaper energy after the initial cost is taken care of. Nuclear Energy Resources : Nuclear energy has emerged as a viable source in recent times. Important minerals used for the generation of nuclear energy are uranium and thorium. Uranium deposits occur in the Dharwar rocks. Geographically, uranium ores are known to occur in several locations along the Singbhum Copper belt. It is also found in Udaipur, Alwar and Jhunjhunu districts of Rajasthan, Durg district of Chhattisgarh, Bhandara district of Maharashtra and Kullu district of Himachal Pradesh. Thorium is mainly obtained from monazite and ilmenite in the beach sands along the coast of Kerala and Tamil Nadu. World’s richest monazite deposits occur in Palakkad and Kollam districts of Kerala, near Vishakhapatnam in Andhra Pradesh and Mahanadi river delta in Orissa. Atomic Energy Commission was established in 1948, progress could be made only after the establishment of the Atomic Energy Institute at Trombay in 1954 which was renamed as the Bhabha Atomic Research Centre in 1967. Solar Energy : Sun rays tapped in photovoltaic cells can be converted into energy, known as solar energy. The two effective processes considered to be very effective to tap solar energy are photovoltaics and solar thermal technology. Solar thermal technology has some relative advantages over all other non-renewable energy sources. It is cost competitive, environment friendly and easy to construct. Solar energy is 7 per cent more effective than coal or oil based plants and 10 per cent more effective than nuclear plants. It is generally used more in appliances like heaters, crop dryers, cookers, etc. The western part of India has greater potential for the development of solar energy in Gujarat and Rajasthan. exceeds 50,000 megawatts, of which one fourth can be easily harnessed. In Rajasthan, Gujarat, Maharashtra and Karnataka, favourable conditions for wind energy exist. Wind power plant at Lamba in Gujarat in Kachchh is the largest in Asia. 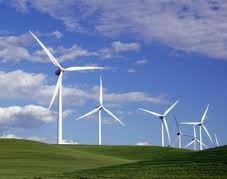 Another, wind power plant is located at Tuticorin in Tamil Nadu. Tidal and Wave Energy : Ocean currents are the store-house of infinite energy. Since the beginning of seventeenth and eighteenth century, persistent efforts were made to create a more efficient energy system from the ceaseless tidal waves and ocean current. Large tidal waves are known to occur along the west coast of India. Hence, India has great potential for the development of tidal energy along the coasts but so far these have not yet been utilised. Geothermal Energy : When the magma from the interior of earth, comes out on the surface, tremendous heat is released. This heat energy can successfully be tapped and converted to electrical energy. Apart from this, the hot water that gushes out through the gyser wells is also used in the generation of thermal energy. It is popularly known as Geothermal energy. This energy is now considered to be one of the key energy sources which can be developed as an alternate source. The hot springs and geysers are being used since medieval period. In India, a geothermal energy plant has been commissioned at Manikaran in Himachal Pradesh. The first successful (1890) attempt to tap the underground heat was made in the city of Boise, Idaho (U.S.A.), where a hot water pipe network was built to give heat to the surrounding buildings. This plant is still working. Bio-energy : Bio-energy refers to energy derived from biological products which includes agricultural residues, municipal, industrial and other wastes. Bioenergy is a potential source of energy conversion. It can be converted into electrical energy, heat energy or gas for cooking. It will also process the waste and garbage and produce energy. This will improve economic life of rural areas in developing countries, reduce environmental pollution, enhance self-reliance and reduce pressure on fuel wood. One such project converting municipal waste into energy is Okhla in Delhi. The challenge of sustainable development requires integration of quest for economic development with environmental concerns. Traditional methods of resource use result into generating enormous quantity of waste as well as create other environmental problems. Hence, for sustainable development calls for the protection of resources for the future generations. There is an urgent need to conserve the resources. The alternative energy sources like solar power, wind, wave, geothermal energy are inexhaustible resource. These should be developed to replace the exhaustible resources. In case of metallic minerals, use of scrap metals will enable recycling of metals. Use of scrap is specially significant in metals like copper, lead and zinc in which India’s reserves are meagre. Use of substitutes for scarce metals may also reduce their consumption. Export of strategic and scarce minerals must be reduced, so that the existing reserve may be used for a longer period.